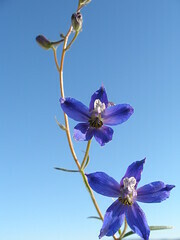 The upland larkspur’s striking blue flowers are borne at the end of a short stem which ranges from six to sixteen inches tall. The flower has five widespread petals that grow together to form a hollow flower with a spur at the end, giving the plant its name--the spur reminiscent of a lark. The leaves are deeply lobed, one to two inches wide, and grow mostly from the base. The plant is hairy, varying from sparse to dense and matted or sticky. Larkspurs kill more cattle on summer range than any other plant or disease. It is acutely toxic. Cattle that eat a lethal dose die within five hours from respiratory paralysis. For millennia the alkaloid-bearing seeds have been ground-up to poison lice. Larkspur flowers were used for a natural dye.